 BEAM - Euroconsult, Satellites to be Built & Launched by 2018, World Market Survey. Euroconsult, a leading international research and analyst firm that specializes in the satellite sector, has just released their Satellites to be Built & Launched by 2018, World Market Survey. The Space Foundation, along with Toffler Associates, recently hosted the 2nd Annual Space Business Forum in New York City. The panels and featured speakers were very engaging and covered many topics of current interest. All participating believe the space industry represents attractive investment opportunities, both from the stability of the industry and the recession resistance offered by the more established aerospace and commercial satellite companies. In addition, theres high potential growth with the more promising, new space entrepreneurial activities. The MSS industry is currently at a crucial point with several operators about to replace their aging satellite constellations, an economic crisis that impacts several key vertical target markets and a difficult environment for financing. Nevertheless, the industry is expected to grow in the years to come, driven primarily by data applications, increasing use of MSS in maritime and aeronautical markets and rising demand in emerging regions. NEAR EARTH EXECUTIVE BRIEFING, Geography On the Map  And Markets! FUTRON EXECUTIVE BRIEFING, Switching It Up: Does Putting Intelligence In Orbit Help Move Content To The Edge? 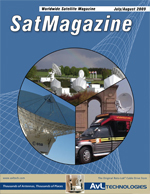 Satellites connect the world, but they generally neither connect to each other nor connect users to each other without some ground-based hub application, which adds time, complexity and cost at various levels. Every satellite link requires at least one spacecraft and two ground terminals. Some use more of one or the other but, until very recently, the only way to interconnect multiple end-users was to route signals through a complex ground network. Satellites have merely been bent pipes modulating and amplifying signals but not acting on the signals with any intelligence. While Iridium created a highly intelligent network ten years ago, with satellites switching signals and communicating with each other, intelligent broadband satellites, with processing, switching and routing capabilities on-board, are just coming into service, at the same time as IP-based services are becoming ubiquitous. This combination has the potential to dramatically change the way content is delivered, shared and stored adding user options and value for a range of key markets. As we hear more and more that the global economic crisis could drag on various industrial segments in general and the satellite industry in particular, it is worth looking at how the mobile satellite services operators have faired over the last 12 months and what lies ahead for them in terms of settling their high capital expenses. Most of the operators have released results from the last year with different levels of success and the admission by all is that they have been hit but much less so than what was expected. Piracy is never far from the pay-TV industrys thoughts. Two recent documents throw some light into the murky world of Conditional Access. First, a White Paper from Barry Flynn and his colleagues at Farncombe Technology* looks closely at the challenges facing traditional Conditional Access systems, and especially those commonly used in satellite DTH. The report states that the traditional one-to-many delivery processes for programming are rapidly changing, and with these changes new CA methods might be needed. When you think of it, despite our having almost instantaneous communications, the world remains a huge place. On Earth as well as in space, the key to survival and success for humans has always been, and will remain, communications. From the oldest methods of fire and smoke messaging, to the telegraph lines strung across continents, to satellite fleets navigating above the Earth in geo-stationary orbits  the propagation of messages, communications, and missives has been the role of the all-important carriers, operators, and distributors. FOCUS: UDcast, Riding The Rails With The Internet  At 200 MPH! We have experienced it all, as far as Internet access is concerned  hotels, airports, train stations, cars with cellular modems, even in planes  Internet access has become a crucial commodity. We cannot live without the Internet anymore, even for just a few hours. For business professionals, travelling without online access is simply unacceptable. CoreTalk: Satellite Deployment  Newtec, Digital Terrestrial and Mobile TVBut What About The Cost? David Ball manages to acquire huge numbers when it comes to air miles, for as Intelsats Regional Vice President, Asia-Pacific, his oversight includes marketing and sales offices in Beijing, Honk Kong, Mumbai, Singapore, Sydney, as well as Tokyo. David accepted his current position in July of 2006, when Intelsat acquired PanAmSat, where he held an identical post, concentrating on sales, engineering, and space systems development from 1995 to 2003. GlobeCast Australias Broadcast Centre in Sydney, which is a 24/7/365 upgraded Teleport and Master Control, is a global junction that enables the connection of broadcasters and events from across the globe. As any veteran of the industry is fully aware, SATCOM culture emanates from a number of specific gene-pools scattered throughout the country. Granted, SATCOM is a global industry, but few would argue that the heritage of satellite communications has roots that can be traced to one of these epicenters in the U.S. Newcomers to the cult may be interested in learning just how these centers came to be and how they ended up in these particular, and in some cases curious geographic locations. Australias involvement in the so called space race has been one of many false starts and has put the country in a position where it really does not play a significant role in the global exploration and commercialization of space.